The ABCNJ Annual Session 2014 continued to raise the bar for Regional fellowship, training and worship. The two minute sermons, give or take a few minutes, were certainly one of my highlights as it helped focus us on the messages. The countdown clocks on the screen had its level of humor for sure but I found myself intensely focused on what the preachers were saying. It reminded me of just how many times in life we are distracted by the environs of time and if we are going to catch the message from God or God’s servants, we have to focus and keep focused and not be distracted by the flashing of signs, the clicking of the clocks, the cell phone disruptions that often enter into the picture. When I am asked to be at the pulpit I know how quickly the worship “hour” comes and goes. Yet, I am also reminded of the Word that has come down in dynamic and powerful ways, still wrapped in simple phrases we all remember. “For God so loved the world…”, “Our Father…”, “You are forgiven…”, or “Be still and know…”. “Sinner saved by grace!” “They’ll know you are Christian’s by our love.” From my vantage point, I again was thrilled by the keynote messages that always drive home our American Baptist missional aspects and challenges facing us as disciples of Jesus Christ our Lord! Missions is truly a core element in our churches ministries. The fact that we received seven new congregations from Florida, all who asked to fellowship with us, affirms our regions multi-cultural and ethnic diverse to everyone at our Annual Gatherings. It now is part of our DNA and reveals the kingdom table which is to come. I also express my deep appreciation for the opportunity to be part of ABCNJ’s ministry over the past ten years as Associate Regional Pastor and one of the staff working under the fine leadership of Rev. Dr. Lee B. Spitzer. I have experienced a great deal working with pastors, officers, teachers, and those whose lives are being touched by God in and through the ministries of our American Baptist Churches of New Jersey and Beyond. The fruit of the Spirit was seen in the songs shared by the Urban Promise Children’s Choir as those familiar words rang out “This little light of mine, I’m going to make it shine….” Their voices spoke to me of a new generation of hope, dreams, and possibilities for those living in the heart of the City of Camden. “Let the children come unto me!” Jesus said. Annual Session has always been a celebration of our diversity, accomplishments, hopes and dreams. This year was no exception. The presenters, musicians, vendors and display tables clearly expressed this year’s theme,“preaching the word, reaching the world”. As Associate Regional Pastor for GoGlobal I especially enjoyed showcasing the many facets of ABCNJ’s mission ministries at my display table. In addition I was able to present a new mission project “Supporting Seira Stitch-by-Stitch”. 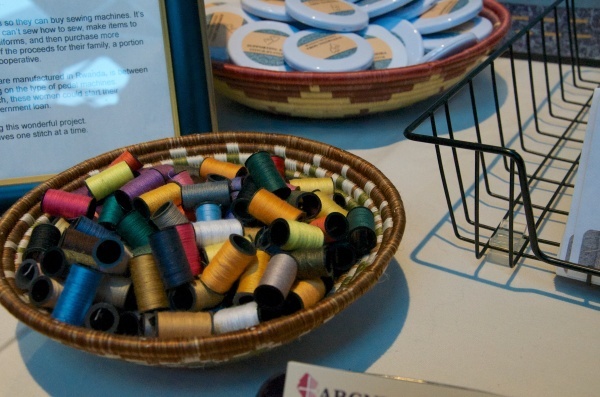 This project offers our ABCNJ churches the opportunity to donate toward the purchase of sewing machines for the women of Rwanda, Africa. And the response was overwhelmingly positive! One of the highlights for me was the 2 minute sermon segment. How refreshing it was to see and hear a diverse trio of pastors, with their own unique styles, “preach the word” in two minutes. Not an easy thing to do. And of course who doesn’t enjoy hearing uplifting music especially when it comes from the Urban Promise Fifth Grade Choir. In our busy world where we rarely speak face to face, annual session offers people the opportunity to connect in person, rekindle relationships, or form new ones, ask questions, and share ideas. In fact, some of the best conversations take place at the display tables. And those connections are vitally important to the health and growth of our region. If you have not attended an annual session please mark your calendars now for next September. You will not be disappointed. La Sesión Anual de las Iglesias Bautistas Americanas tuvo lugar en la ciudad de New Brunswick en los días 26-27 del pasado mes de septiembre. Alrededor de 600 personas asistieron a este magno evento con una entusiasta participación de la mayor parte de nuestras casi 300 iglesias en la Región. Como cada año, nos animó mucho ver que estuvieron representados todos los grupos culturales y las distintas lenguas que integran nuestra denominación. El grupo musical Shalom de la juventud hispana de la Primera Iglesia Bautista de New Brunswick fue quien asumió la responsabilidad de abrir la Sesión Anual con cantos de alabanzas y música de adoración. Hay que destacar que este año tuvo gran significado para el Área de los Ministerios Latinos la visita oficial al evento de una delegación muy representativa de la Convención Bautista Nacional de Brasil, denominación hermana con la sostenemos vínculos misioneros y fraternales. Tres pastores jóvenes de esa nación sudamericana nos animaron con su testimonio. Ellos además completaron una intensa jornada de actividades antes y después del evento, sobre todo porque visitaron las iglesias latinas (de habla hispana y portuguesa) para traernos el mensaje de la Palabra de Dios y compartir acerca de la Obra del Evangelio en su país. Además, sobresale que por primera vez en la larga historia de nuestras convocaciones generales se llevó a cabo una especial actividad luego de concluida la Sesión Anual. La Juventud Bautista de New Jersey se reunió en el santuario de la Primera Iglesia Bautista de New Brunswick para una gran fiesta de adoración y confraternidad. Más de 200 personas concurrieron a un programa musical combinado con la elocuente presencia de las más diversas agrupaciones del más diverso espectro cultural y étnico en nuestra Región. El motivo inicial fue agasajar a la delegación brasileira, porque ellos representan el Ministerio de la Juventud de aquella Convención Bautista Nacional. El programa fue un éxito en su realización musical, testimonial, tecnológico y fraternal, especialmente porque los jóvenes se conocieron y compartieron entre sí en un nuevo nivel de relación. Damos la gloria a Dios por esta gran experiencia que ha sido para los Ministerios Latinos de ABCNJ la celebración de la Sesión anual de 2014. I arrived to Annual Session extremely jet lagged, running on embers, as I just returned from my honeymoon. The day from my vantage point was experienced outer body. Since all of me was not available, it made me pay closer attention to every conversation, question asked, presentation, and song sung. Interesting, how the mind will chime in so intently when the body is incredibly fatigue. Annual Session awakened, rather, reawakened my thirst for religion to work in society. My spirit rejoiced; as I sat listening to the call for sewing machines for women in Rwanda, the illuminating parallel between church and gangs painted by our guest speaker Rev. Romal Tune, the introduction of the new ABCNJ Relief trailer or even hearing my own voice echo while praying for victims/survivors of violence and perpetrators. Here were experiential examples of the church working in society. And where it was not already doing so, there was a call, admonition to move pass the comfort of walls and traditions in order to be a catalyst for God to meet people in the intersections of their lives. This joyful experience was culminated by the Regional Wreath of Healing. The wreath initially bare, signified the vulnerability victims often feel. 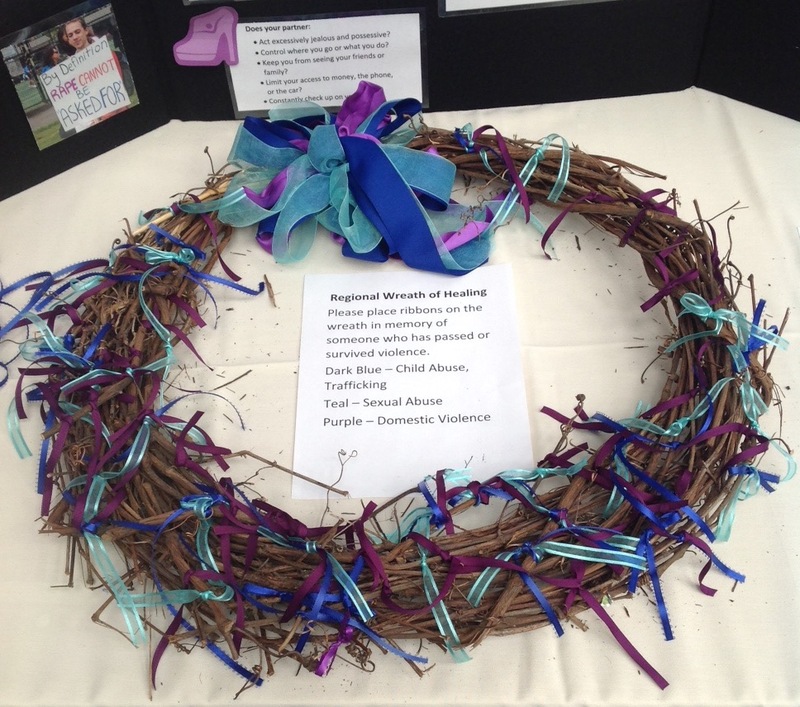 Yet in the span of the early afternoon the wreath became covered with shades of purple, teal and blue ribbons. I remain in awe with the testimonies shared from survivors. Many this year took pictures of the display and several churches left flyers for programs they will be hosting this month to bring about awareness. I suppose I should be grateful to the NFL for the push. For making us, the church, less afraid to tackle the subject. Notable was the woman who thanked me for praying for those who perpetrate too. Honestly, I was afraid of that part of my prayer. Afraid it would be misunderstood, although we are called to pray for our enemies. But my greatest delight at Annual Session involved the exchange with one of the youth from Urban Promise. She asked about the wreath and upon telling her, her youthful hands reached for multiple ribbons as she replied, “Ooh yeah I know many.” In that moment I realized the wreath proved to be an intergenerational, intercultural, multilingual beacon of God’s people covering those hurting. In the simple gesture of tying a ribbon, as a region, we helped reclaim the voices silenced by violence. More than just an alliteration, the theme of the 2014 ABCNJ Annual Session on “Preaching the Word, Reaching the World” underpinned the celebration of this year’s annual gathering of ABCNJ to celebrate the salient ministries that our regional family of churches have engaged in during the last 12 months. Our regional vision continues to define what we do as a family of American Baptist churches in New Jersey not only in the USA, but around the world. The week leading up to the annual session was really unique this year. The ABCNJ ministry team hosted a delegation of youth leaders from our Baptist partners in Brazil, who were accompanied by IM/ABCUSA missionary to Brazil, Rev. Dr. Ann Borquist. Vern and I spent two days with our Annual Session guests, taking them around the historical sites and museums in Philadelphia as part of their “immersion” experience in the culture and history of America, following a day in New York City focusing on 9/11 and the Metropolitan Museum of Art. They were overwhelmed in discovering the “birthplace” of the United States in Independence Hall. We also learned a whole lot more about Brazil and, most of all, something about the passion and commitment of these young men to the young people of our Baptist partners there. It was a joy to see them participate in several areas of our busy two-day annual session weekend. The weekend was kicked off by the ABCNJ Pastors’ Academy. We believe that learning doesn’t stop when a pastor graduates from seminary. The life of scholarship and study is a life-long journey. Academy workshops focused on Financial Accounting and Legal Responsibilities, with ABCNJ’s CPA and legal counsel leading those two workshops, respectively. The third session was on Youth Ministry, where our guests from Brazil and missionary Ann Borquist shared their experience leading this program back in Brazil. Dr. Lee Spitzer and Terri McAdoo, from Cherryville Baptist, completed the Academy with a presentation on the role of Email and Social media in Pastoral Ministry. Annual Session itself percolated with energy and activity, as the many facets of ABCNJ’s ministry during the last 12 months were placed center stage. ABCNJ’s disaster response to Hurricane Sandy and to Typhoon Haiyan in the Philippines were highlighted by Denise Gratzel, ABCNJ disaster response coordinator. ABCNJ’s special ties with the Convention of Philippine Baptist Churches helped shape the priorities that ultimately guided our national effort through the One Great Hour of Sharing funds overseen by the World Relief Office and the East Asia and India desk of International Ministries. Denise Gratzel also “unveiled” the new ABCNJ Disaster Response mobile trailer that contains the essential tools and equipments of our response teams and is emblazoned by a striking logo that Denise designed! The program was anchored by several pastors of the region, tasked to preach 2-minute sermons on our call to ministry engagement, then responded to by lead persons of these various ministry engagements that took place the previous 12 months - the mission trip to an emerging new Baptist partner in Rwanda, the call for our churches to be “Sacred Safe Spaces” that cultivate a culture that rejects domestic violence, and cares for its victims. The capital campaign for Camp Lebanon, “Cedars of Lebanon 2020” is growing, and already is sending youth to camp through investment income scholarships. The President of ABCUSA, Rev. Dr. Don Ng, and the new President of Eastern University and Palmer Seminary, Dr. Robert G. Duffett, Rev. Dr. Ann Borquist, IM missionary to Brazil, and Romal Tune, author of “God’s Graffiti” were featured speakers and preachers, underscoring ABCNJ’s commitment to higher education, denominational life, spirituality, and reaching out to the younger generation. Talking about younger generation, the Annual Session was capped by a rousing “Next Generation” party and regional gathering of ABCNJ’s young people where our Brazilian guests were featured leaders and speakers at First Baptist Church of New Brunswick. 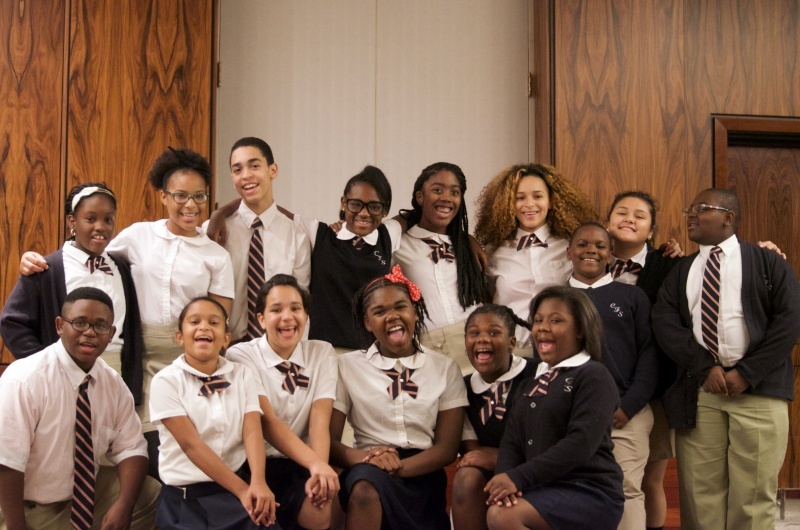 More than 200 ABCNJ young people attended! If you are reading this and you are feeling tired already, I call it holy fatigue - to Christ be the glory!